There are many different ways to make nanomaterials but weaving, the oldest and most enduring method of making fabrics, has not been one of them – until now. 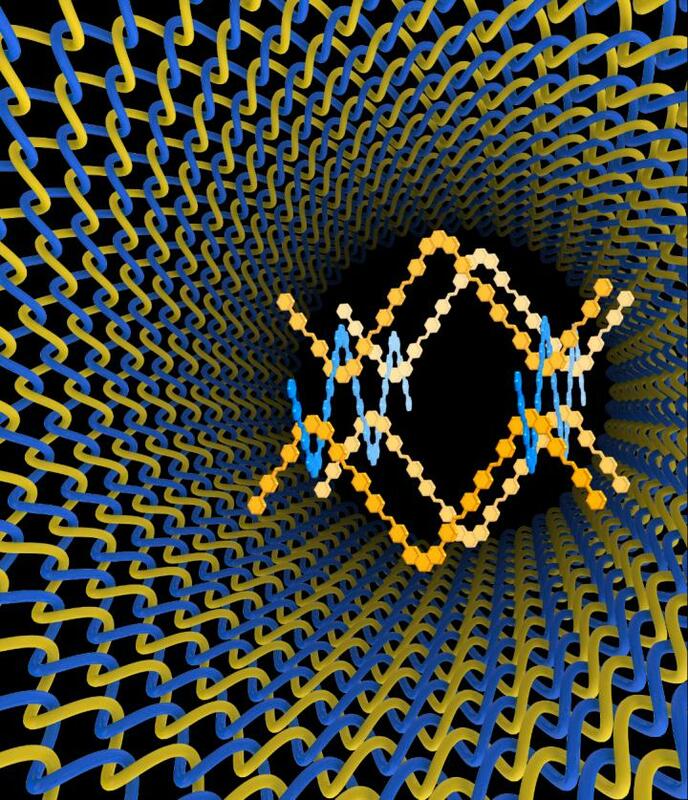 An international collaboration led by scientists at the U.S. Department of Energy (DOE)'s Lawrence Berkeley National Laboratory (Berkeley Lab) and the University of California (UC) Berkeley, has woven the first three-dimensional covalent organic frameworks (COFs) from helical organic threads. The woven COFs display significant advantages in structural flexibility, resiliency and reversibility over previous COFs – materials that are highly prized for their potential to capture and store carbon dioxide then convert it into valuable chemical products. "We have taken the art of weaving into the atomic and molecular level, giving us a powerful new way of manipulating matter with incredible precision in order to achieve unique and valuable mechanical properties," says Omar Yaghi, a chemist who holds joint appointments with Berkeley Lab's Materials Sciences Division and UC Berkeley's Chemistry Department, and is the co-director of the Kavli Energy NanoScience Institute (Kavli-ENSI). "Weaving in chemistry has been long sought after and is unknown in biology," Yaghi says. "However, we have found a way of weaving organic threads that enables us to design and make complex two- and three-dimensional organic extended structures." Yaghi is the corresponding author of a paper in Science reporting this new technique. The paper is titled "Weaving of organic threads into a crystalline covalent organic framework." The lead authors are Yuzhong Liu, Yanhang Ma and Yingbo Zhao. Other co-authors are Xixi Sun, Felipe Gándara, Hiroyasu Furukawa, Zheng Liu, Hanyu Zhu, Chenhui Zhu, Kazutomo Suenaga, Peter Oleynikov, Ahmad Alshammari, Xiang Zhang and Osamu Terasaki. COFs and their cousin materials, metal organic frameworks (MOFs), are porous three-dimensional crystals with extraordinarily large internal surface areas that can absorb and store enormous quantities of targeted molecules. Invented by Yaghi, COFs and MOFs consist of molecules (organics for COFs and metal-organics for MOFs) that are stitched into large and extended netlike frameworks whose structures are held together by strong chemical bonds. Such frameworks show great promise for, among other applications, carbon sequestration. Through another technique developed by Yaghi, called "reticular chemistry," these frameworks can also be embedded with catalysts to carry out desired functions: for example, reducing carbon dioxide into carbon monoxide, which serves as a primary building block for a wide range of chemical products including fuels, pharmaceuticals and plastics. In this latest study, Yaghi and his collaborators used a copper(I) complex as a template for bringing threads of the organic compound "phenanthroline" into a woven pattern to produce an immine-based framework they dubbed COF-505. Through X-ray and electron diffraction characterizations, the researchers discovered that the copper(I) ions can be reversibly removed or restored to COF-505 without changing its woven structure. Demetalation of the COF resulted in a tenfold increase in its elasticity and remetalation restored the COF to its original stiffness. "That our system can switch between two states of elasticity reversibly by a simple operation, the first such demonstration in an extended chemical structure, means that cycling between these states can be done repeatedly without degrading or altering the structure," Yaghi says. "Based on these results, it is easy to imagine the creation of molecular cloths that combine unusual resiliency, strength, flexibility and chemical variability in one material." Yaghi says that MOFs can also be woven as can all structures based on netlike frameworks. In addition, these woven structures can also be made as nanoparticles or polymers, which means they can be fabricated into thin films and electronic devices. "Our weaving technique allows long threads of covalently linked molecules to cross at regular intervals," Yaghi says. "These crossings serve as points of registry, so that the threads have many degrees of freedom to move away from and back to such points without collapsing the overall structure, a boon to making materials with exceptional mechanical properties and dynamics." This research was primarily supported by BASF (Germany) and King Abdulaziz City for Science and Technology (KACST).